Offers a retail, commercial, and investment services through 35 offices in Maryland. Full-service banking, including internet banking, telephone banking, bank machines and Interac, branch banking, investments, correspondent banking with access to international services. Banking company which performs commercial banking operations, mortgage banking, investment banking services and other related financial activities. (Nasdaq: RBPAA). Full-service banking, including PC Banking, Telephone Banking, Bank Machines, Interac, Branch Banking. bank company which performs commercial banking operations, trust services, mortgage banking, investment banking services, insurance services and other related financial activities. (nasdaq: sbcfa). Provides retail banking, asset management and private banking, corporate and investment banking. Treasury, internet banking and core banking solutions for the banking industry. Bank holding company with subsidiary which performs commercial banking operations, trust services, international banking, investment banking services, investment advisory services, mortgage banking and other related financial activities. (Nasdaq: FOBB). Multi-bank holding company with subsidiaries which perform commercial banking operations, mortgage banking, trust services, insurance services, investment banking services, credit card services, international banking, leasing and other related financial activities. (Nasdaq: FMER). Bank company which perform commercial banking operations, mortgage banking, investment banking and other related financial activities. (Nasdaq: SBIT). performs commercial banking operations, mortgage banking and other related financial activities. includes online banking. (nasdaq: pnbk). Bank holding company with subsidiaries which perform commercial banking operations, mortgage banking and other related financial activities. (Nasdaq: COLB). Bank and savings and loan holding company with subsidiaries which perform commercial banking operations, savings bank operations, international banking, leasing, mortgage banking, investment banking and other related financial activities. (Nasdaq: BPOP). Bank holding company with subsidiaries which perform commercial banking operations, mortgage banking services, investment banking services, credit card services, investment advisory services, international banking and other related financial activities. (Nasdaq: LION). Bank holding company with subsidiaries which perform commercial banking operations, mortgage banking, leasing, insurance services and other related financial activities. (Nasdaq: CBCF). Bank holding company with subsidiaries which perform commercial banking operations as well as credit card, insurance, mortgage banking, investment banking , leasing, and trust services. (Nasdaq: IRWN). Locally based banking and financial services provider, offers online banking, mortgages, business and personal banking services. Provides Credit Risk Management software compliant with Basel II, other products and services for the banking, Islamic banking and financial industry. Bank holding company with subsidiaries which perform commercial banking operations, mortgage banking and other related financial activities. (Nasdaq: CSNT). Bank company which performs commercial banking operations, investment banking, mortgage banking and other related financial activities. Based in Florida. (Nasdaq: TIBB). Bank holding company with subsidiaries which perform commercial banking operations, investment banking services, mortgage banking services and other financial activities. (Nasdaq: GBCI). Largest banking group, provides consumer, and banking services in Malaysia. Include internet banking. Bank holding company with subsidiary which performs commercial banking operations, mortgage banking, credit card services and other related financial activities. (Nasdaq: WBCO). Bank holding company with subsidiary which performs commercial banking operations, mortgage banking, trust services, investment banking services and other related financial activities. (Nasdaq: CORS). Bank holding company with subsidiary which performs commercial banking operations, mortgage banking services, credit card services, international banking and other related financial activities. (Nasdaq: GBCB). Bank holding company with subsidiaries which perform commercial banking operations, mortgage banking, leasing, investment banking services and other related financial activities. (Nasdaq: PFGI). Bank holding company with subsidiaries which perform commercial banking operations, investment banking services, mortgage banking services and other related financial activities. (Nasdaq: GFLS). If the business hours of Farmers and Mechanics Bank in may vary on holidays like Valentine’s Day, Washington’s Birthday, St. Patrick’s Day, Easter, Easter eve and Mother’s day. We display standard opening hours and price ranges in our profile site. We recommend to check out fmbancorp.com/ for further information. 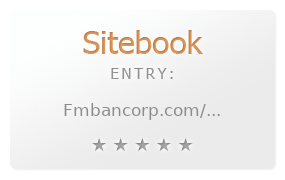 You can also search for Alternatives for fmbancorp.com/ on our Review Site Sitebook.org All trademarks are the property of their respective owners. If we should delete this entry, please send us a short E-Mail.